Product #60503 | SKU MVK500190XV | 0.0 (no ratings yet) Thanks for your rating! Includes a flat base fluid video head and a flat base 2-stage tripod with a ball-leveling center column. 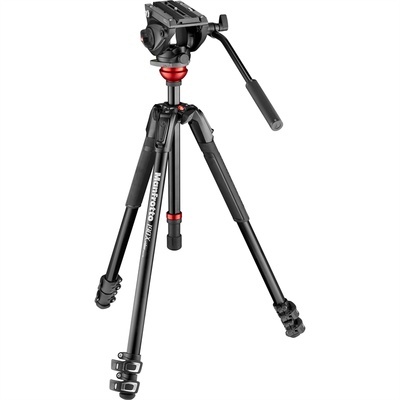 The Manfrotto 500 Fluid Video Head with 190X Video Aluminum Tripod & Leveling Column Kit includes a flat base fluid video head and a flat base 2-stage tripod with ball-levelling centre column. The head features a wider-than-standard platform to provide better support for DSLRs, and supports a maximum load capacity of 5kg. A 500PLONG quick release plate is included, and the head's side lock mounting system enables the plate to click in from above, instead of aligning and sliding in from one end. Fluid cartridges on both the pan and tilt axes provide resistance for smooth, controlled pan and tilt. The tilt range is -70° / +90° and the pan rotation is 360°. The spring-loaded counterbalance is preset at 2.4kg. The camera plate has both 1/4"-20 and 3/8"-16 camera screws, and the head has a 3/8"-16 tripod mounting thread and a 3/8"-16 Easy Link connector for accessories such as a video monitor. The 3-section tripod legs feature aluminium construction, and each leg extends in two stages. The built-in Quick Power Locks secure the legs at the length you select. The tripod legs are adjustable to a maximum height of just under 150cm without extending the centre column, and feature a spreader-less design with each leg featuring four independent locking positions of 25, 46, 66, and 88°.